Hale's Early (Prunus 'Hale's Early'), which was first introduced in the United States is a hardy early peach variety, particularly suited for the British climate. Its skin is crimson streaked and its flesh is a pale-yellow, tender, melting and are a delicious taste. A free of stone variety. What is more, Hale's Early produces heavy crops and is self-fertile, so no need for another peach for production of a peach crop. 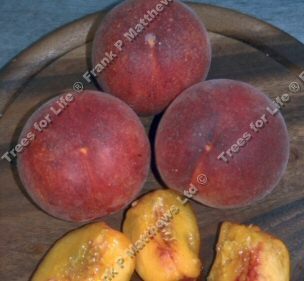 Self-Fertile/Not Self-Fertile: Hale's Early is a self-fertile peach, therefore it will produce Peach fruits without the need of a second Peach tree nearby. It could be said that this makes the peach tree very independent and as with all very independent people, if you ask it are you ok, you won't get much of a reply.